How did we get here? Immediately upon the election of Donald Trump, we identified DACA as being in jeopardy. After all, as a candidate, Donald Trump railed against the program, calling it an abuse of power. He also appointed individuals to his leadership team such as Attorney General Jefferson Beauregard Sessions and advisers to the President, Steve Bannon and Stephen Miller with known hostility to the program. Many expected that Trump would end the program in his first week in office. However, he did not and told the world that he had a big heart for the Dreamers. Reports surfaced that Steve Bannon was advising Trump to use DACA as a bargaining chip in future negotiations with Democrats. Meanwhile, the Citizenship & Immigration Service continued to grant DACA extensions and even new DACA cases. Then, the administration formally rescinded Deferred Action for Parental Accountability (DAPA) and expanded DACA. These programs had never been implement and were frozen in place due to the nationwide injunction entered in Texas. Yet, when they were rescinded, the administration was clear that they were not touching DACA in that notice. For several weeks, it looked like DACA was being spared. The sense that DACA was being spared enraged many Trump supporters. They found a champion in Texas Attorney General Ken Paxton. Paxton wrote the Justice Department last month threatening to sue the U.S. government by September if the administration did not “phase out DACA.” He wrote the letter on behalf of ten states. Of course, the man in charge of defending DACA would be Jefferson Beauregard Sessions, the Attorney General, whose hostility to DACA is well documented and is the former employer of Stephen Miller, the White House aide responsible for immigration matters. While the Justice department states that it is reviewing the letter and their legal position, the secretary of Homeland Security is expressing doubts about the program’s ability to survive a legal challenge. We think that Secretary Kelly’s comments are very concerning. We think that the White House is using the Paxton letter for cover to do what they wanted to do anyway; end DACA. We would not be surprised if some time next month, the Justice Department announces that it is not going to defend DACA in court, signaling that DACA will fall. But it does not have to. 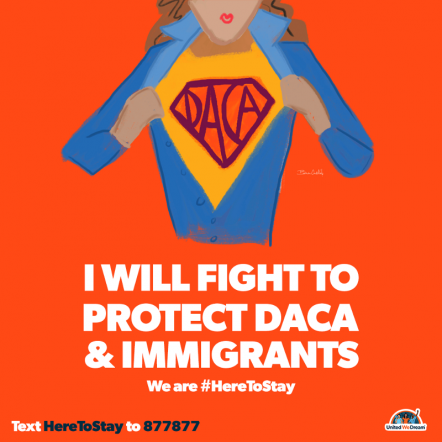 Now is the time to step up public pressure to protect the 800,000 young people with DACA. Start here. More ideas here.